Malin Gabriella Nordin has been one of the most talked about Swedish up and coming artists in the past years. With her art works in various shape, material and color, she captures natural forms and transform them into eclectic and abstract works of art. With a strong wish to push her boundaries, Nordin just did a collaboration with fashion brand Filippa K, where the artists made a limited edition silk scarf. Together they wanted to dissolve the distinction between fashion and art. 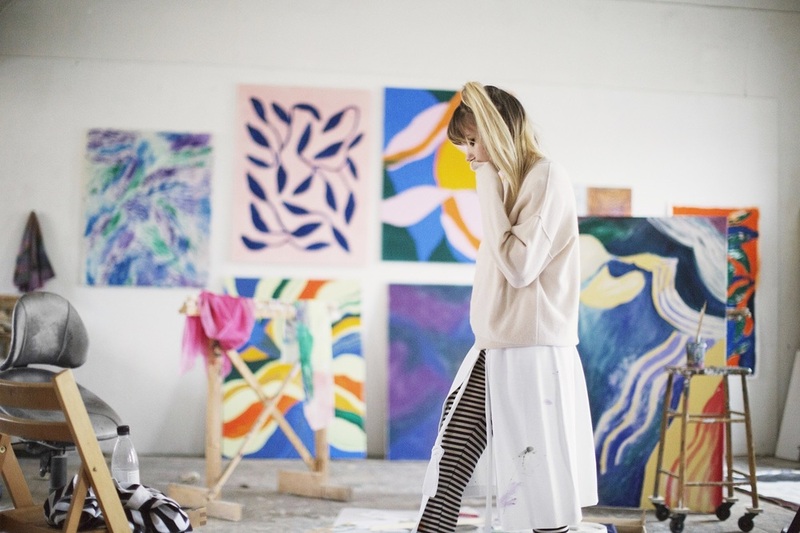 "Visiting Nordin's studio we were instantly drawn to her abstract, colorful expression and effortless process. The idea of a scarf came early on as a fusion between what we do and what Malin Gabriela Nordin is creating, which will result in both a work of art and a piece of clothing," says Creative Director at Filippa K, Nina Bogstedt, in a press release. The team at Filippa K carefully selected one of Malin's designs, an art piece with a sculptural and tree-dimensional pattern with eccentric colors, to be printed on a limited edition scarf, made by hand and numbered 1-125. Malin Gabriella Nordin was also happy about the collaboration, a process she found both fun and relaxed. "I think the scarf turned out very beautiful. It is always intriguing for me to reach out through a completely different platform than I’m used to," says the artists.